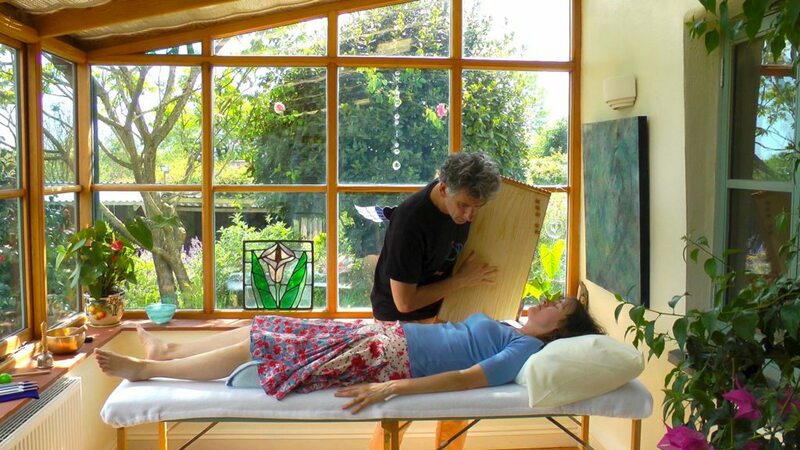 Anne runs a flourishing Sound Healing practice in the Blue Mountains in Australia and is an Associate Teacher with the Sound Healing Academy. Anne Ridgway is launching our first Level 2 course in Australia on 21st July 2016. This is a 5-day intensive workshop blended with online learning. To join this course, you must have taken our Level 1 course first. The next Level 1 four – day intensive workshop Course will be held from 29th September – 2nd October 2016. Tony Nec has over 25 years experience as a therapist, coach and trainer. He is the Principal of the Colour of Sound Institute. The dictionary definition of a gong is simply a resonant metal disk or saucer-shaped bell that emits sound waves when struck by a hammer. But in actual fact, the gong is far more than this concise description encapsulates. It is, in fact, a versatile sound healing instrument capable of producing a wide variety of intricate acoustic tones depending on how it is played. 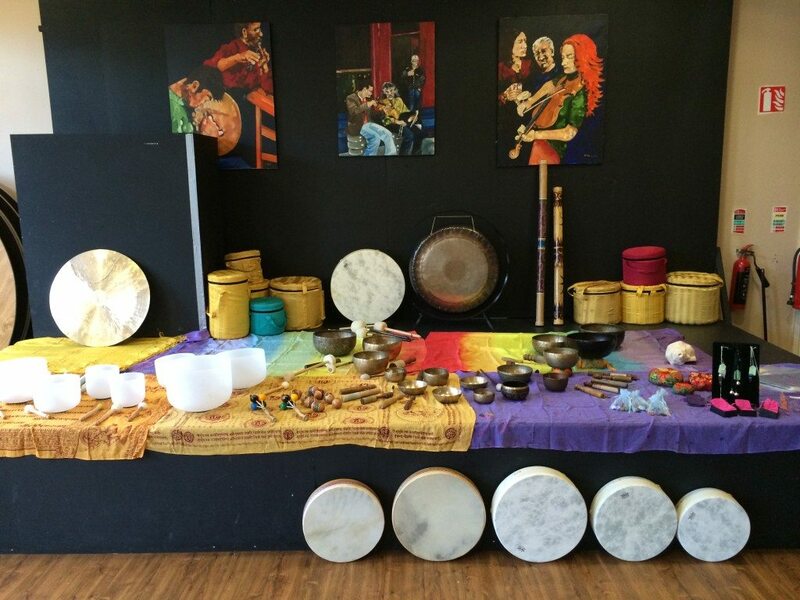 The combination of striking force, striking sequence, striking rhythm imparted to the gong by the player, coupled with the resultant oscillatory wave motion of the resonating gong, all contribute to the final quality of the generated sound and the transmitted healing effect. 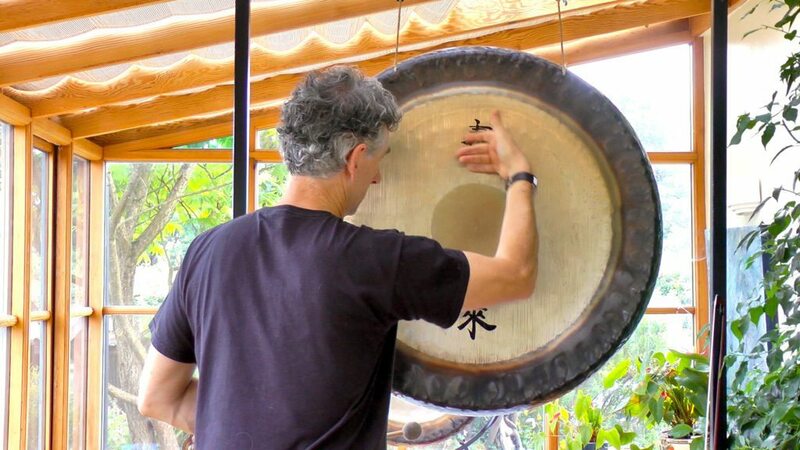 In this posted article, I will be taking a brief tour of the foundation steps to explore more about the acoustic characteristics of the gong and how to play it. Gongs can be classified into two distinct categories : hand-held and stand-mounted. 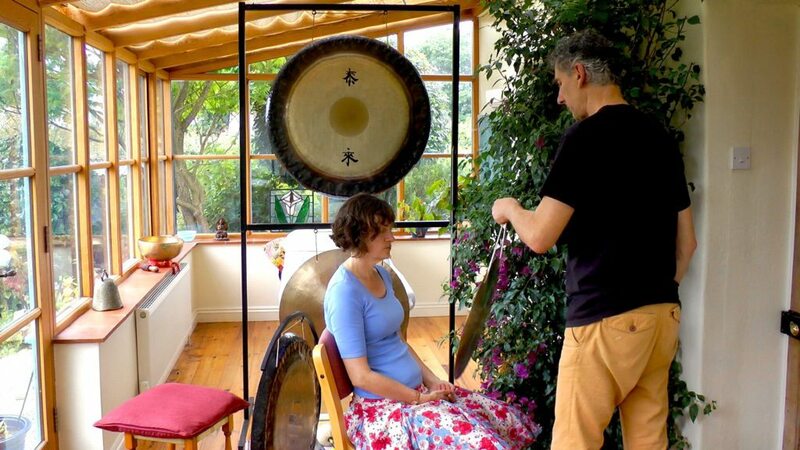 Typically, sound healers tend to concur that the ideal and most comfortable size range for hand-held gongs is between 18-20 inch (45-50 cm) in diameter. Any smaller than 18 inch potentially reduces the quality of tone and thus the resultant range of healing effects may diminish. Conversely, depending on your strength, gongs larger than 20 inch can become quite cumbersome and heavy for carrying around and working off the body of a client. First off is the simple Wind Gong –being of a thin, flat shaped, rim-less disk, it is relatively lightweight, easy to hold and manoeuvre, thus ideal for playing around a client. Second, and slightly more sophisticated, is the Chow Gong –its rimmed construction enables the capacity for larger sizes beyond that of wind gongs, and so heavier and capable of deeper tones on the limits of hand-held practicality. 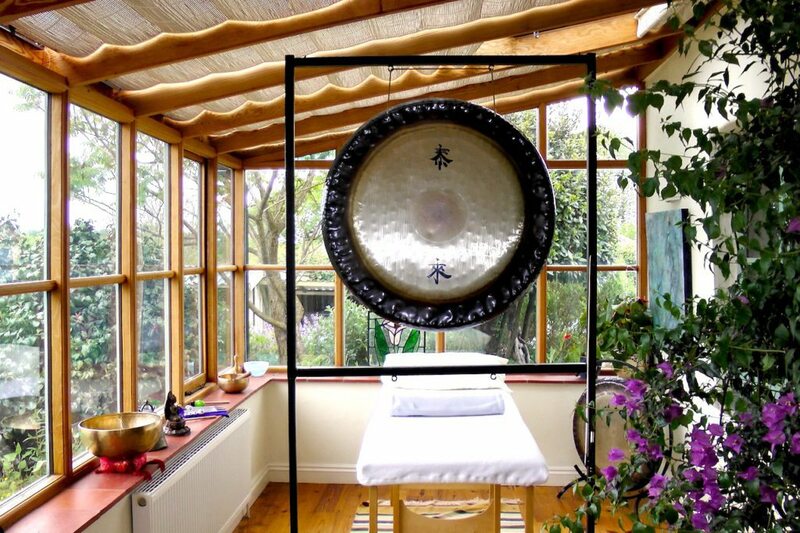 At the top end of the scale is the Symphonic Gong, an imposing presence in any sound healing space – its size and weight makes it unsuitable for hand-held work for any length of time and so are often stand mounted. 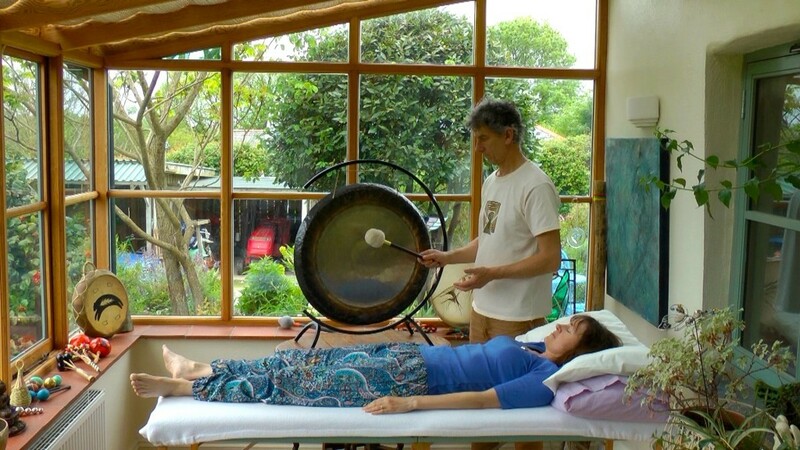 The gong’s static position enables it to be raised to the same height as the client so that the client can benefit from the stream of emerging sound waves. The hardness or softness of the striking end of the gong mallet is key to the sound produced. The harder the mallet end, the brighter the sound whilst, a softer ends yield more muted and mellow tones. It recommended to have a variety of cloth-ended mallets available to explore the range of tonal extremes. In addition, percussion mallets with a small ball head, are ideal for playing the gong’s rim and creating high tones. Also small rubber headed balls –or flumy, can be drawn across the gong’s face to produce whale-like timbres. There is also, of course, the use of our very own finger tips! There is the central hub – where the fundamental notes and deepest tones are to be found. Further out is the outer annulus – towards the edge of the gong is where the overtones evolve and higher pitches will register. Then at the periphery is the rim – in larger sized gongs, this is the mechanically stiffest part of its construction and so possesses the highest resonant frequencies. 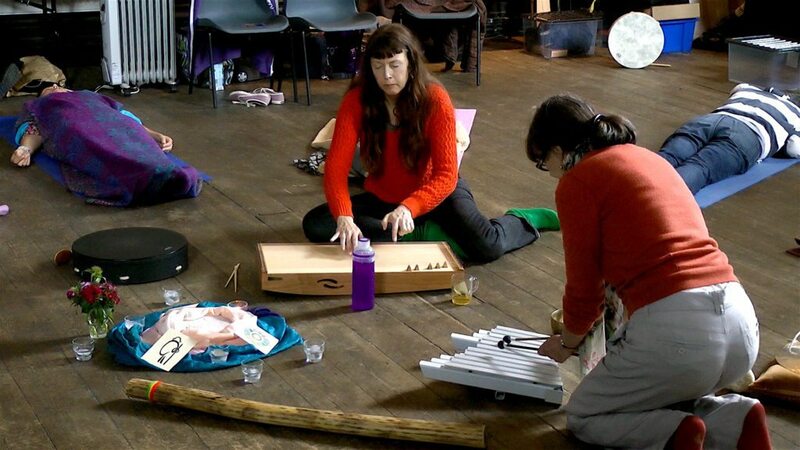 More often than not, the sound healer is seeking either the releasing or harmonising effect of multiple tones that lay beyond the resonance of the fundamental note. Consequently, the gong’s hub is considered inert space and so the gong is generally played off- centre, to the side of the central zone, to benefit from the myriad of overtones in its outer disk. 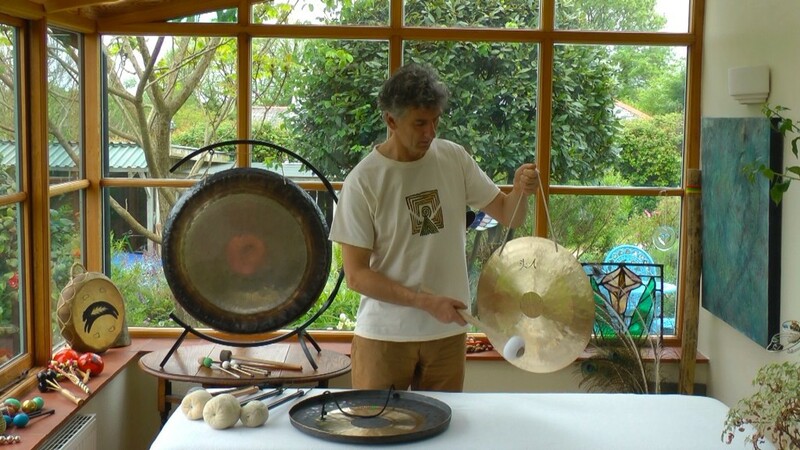 In order for the incident sound waves from the gong to emerge as pristine as possible, without undergoing resistance, or being unduly altered or distorted by reflection from internal surfaces or impinging bodies, it is worth considering the gong’s placement in the surrounding space when it is being played. Multiple reflections, not always heard as distinct echoes, have the effect of prolonging or “colouring” the original sound quality. Reverberation time of an enclosed space will vary according to room dimensions, the distance between the gong and other surfaces, each surface having a different sound absorption rate. Acoustic screens – such as curtains, carpets, will attenuate high frequencies. Panel and cavity walls will soak up low frequencies. So perhaps experiment to see what sounds best. Placing the gong in a space such that there is equal and unimpeded distance forward and aft of the gong, will help to optimise and preserve the original sound qualities. 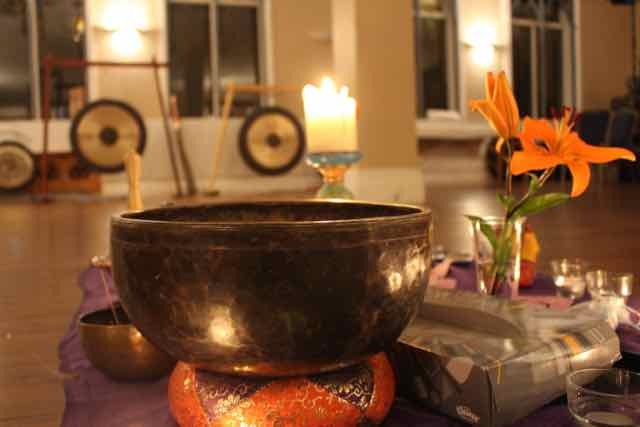 As a prelude to working with the gong within a sound healing session, it is customary to initially “wake-up” the instrument from slumber – to get it resonating! This process is termed “Priming the Gong” and can be achieved by slowly and gently tapping within the outer annulus, either using the fingers or a soft-headed mallet, and letting the sounds quietly and gradually emerge and blossom. In a typical gong session, the sound is introduced quietly, increasing the volume to reach a crescendo and then allowing that intensity to diminish, even into silence before repeating this sequence over a few minutes. Thus, being able to generate and control the volume of the emerging sound is a key practice to master. Sound volume or, more technically, the amplitude of the sound wave, is proportional to how much force is applied to the gong when striking it. Striking the gong perpendicular to the disk –i.e. tapping, will cause a single resultant force in the same direction. But, applying a glancing blow causes two lesser forces to be generated and thus moderates the sound’s volume. So by varying the glancing angle of strike, the intensity of sound can be managed. The amplitude of sound can also be augmented by increasing the frequency of strikes or tempo –the speed of repetitive strikes. The more strikes in a given time, the higher the volume for the same force. In all styles of playing, the volume is kept intentionally low as this serves to be more restful and relaxing for the client. There may be an occasion when a loud “thunderbolt” strike is required to shake things up – but usually the gong’s extensive range of tones are nurtured by a soft and gentle touch and naturally allowed to work their magic. So, for the reasons given, the glancing strike is the most widely used and versatile way of imparting a force to resonate the gong. This skimming movement of the mallet across the gong disk, either as a down-stroke (when below the gong centre) or as an up-stroke (when above gong centre), stems from a flicking motion centred at the player’s wrist. This technique is key to master playing the gong. The force and effort imparted within the glancing strike can be varied and graded simply as soft, firm and hard –with a 25-50% increase in force delivery between each grade. It will be noticed that repeated striking of the gong will actually deaden the sound, inhibiting it to fully resound across its tonal range. The player will recognise that to harvest the full sound spectrum from a single glancing strike, sufficient time must be allowed between consecutive strokes for the sound to blossom to its full potential. The gong is a percussion instrument. So rhythm and tempo are vital facets of gong playing to allow for that all-important sound emergence. Once again, the speed at which the strokes are imparted can be simply graded as slow, medium and fast –with a 25-50% increase in speed between each grade. So these basic techniques enables the player to get the gong resonating to achieve the instrument’s full sound potential. In addition, the player needs to be able to attenuate or dampen the emerging sound. Dampening can be achieved in one of two ways : either by placing a hand firmly on the gong rim –diminishing the sound rapidly or, more gradually, by pressing a soft-headed mallet against the disk to deaden the sustain. Another aspect to gong playing is to establish where to strike the gong disk to achieve the desired sound effect. Systematically, one can imagine the gong’s disk resembling points on a clock face with 12 o’clock at the top. The clock face analogy is very useful when trying to build and later, reproduce a sequence of strokes to create a desired sound and healing effect. One particular simple 4-stroke sequence is 6-3-12-9 or the cardinal points sequence. The arrows beside each clock position in the sequence is indicative of the direction of glancing stroke for a right-handed player. It is also possible subtly raise or lower the note frequency or pitch at each clock position simply by reversing the direction of the glancing stroke. So for example, the tonal frequency at the 6 o’clock position can increased by an up-stroke towards the gong centre instead of the conventional down-stroke towards the rim. Conversely, at the 12 o’clock position, the pitch can be lowered by playing the stroke in the reverse direction. There are also combinations of 2-stroke diagonal sequences, like 3-9 and 2-8 and their reversals, that offer further potential for different tones and pitches. However, when playing the gong’s diagonals, in particular, it causes the gong to “wobble” out-of-plane producing “wah-wah” and pulsing effects. 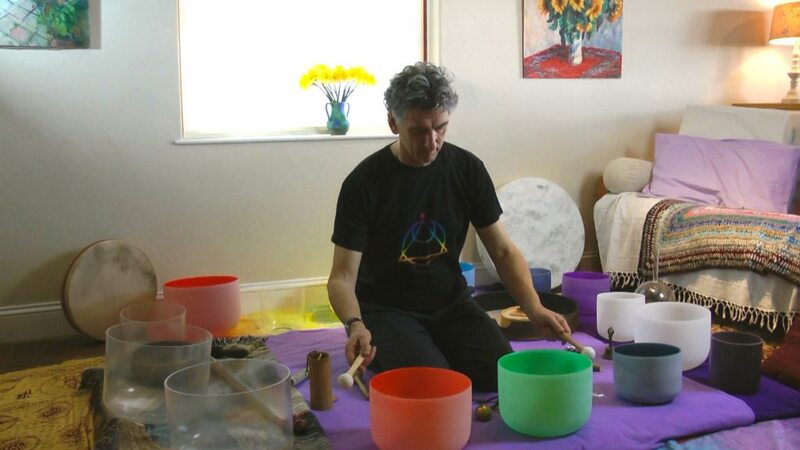 This adds yet another dimension to gong playing by considering the resultant motions of the resonating gong and how such reactions can be used to generate and propagate wave motion as part of the healing effect. 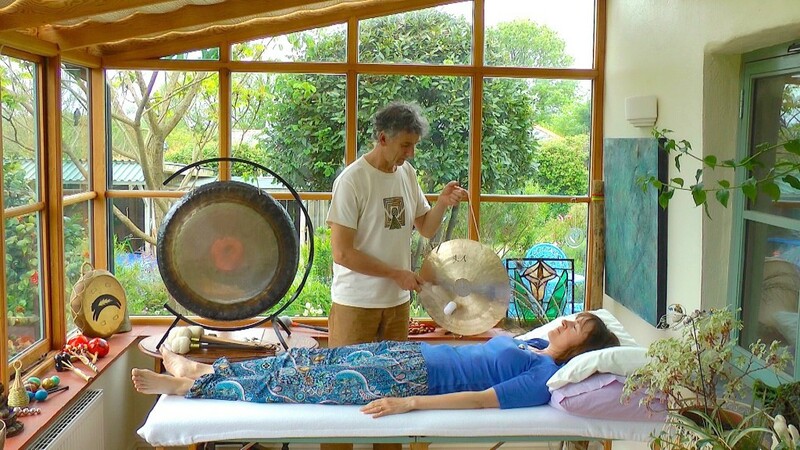 A resonating hand-held gong can be set into three types of motion activating unique healing effects. 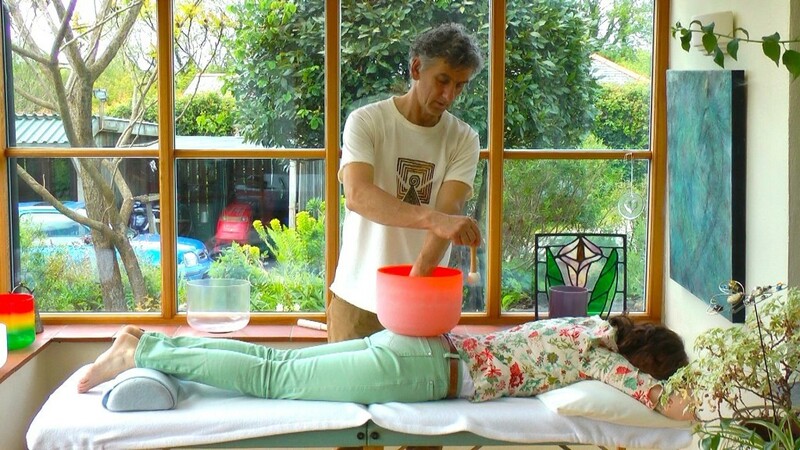 One technique is fanning the resonating gong axially forward and aft along its axis –towards and away from the client to introduce pulsating waves. 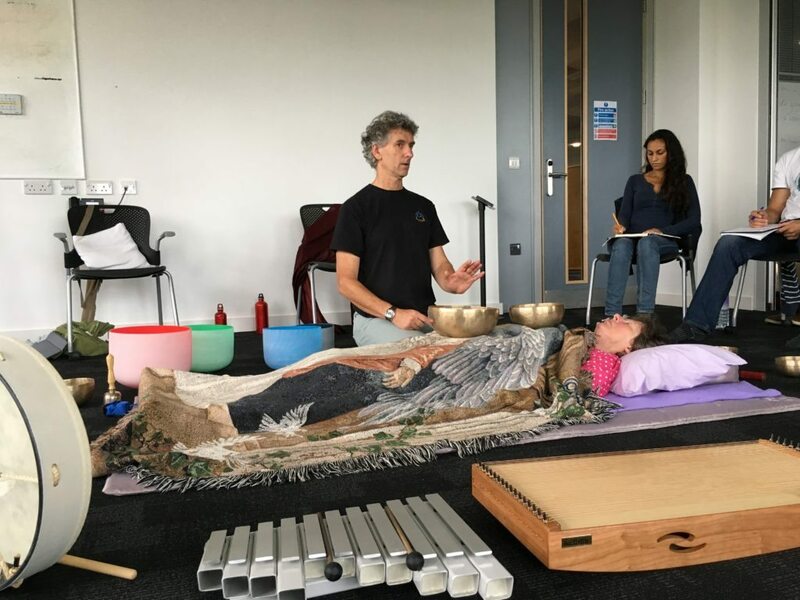 The sound healer’s body position is vital; a relaxed centre-grounded stance will allow for ease of playing and it is essential to create a sense of balance in sync with the gong’s motion. The gong is held out to one side of the healer so that the emitted sound waves are not distorted by the healer’s own body. Another technique is swinging the vibrating gong, moving it laterally in-plane as if it were a clock pendulum. This motion is particularly useful when wanting to move around the client. Whereas the fanning motion is only suitable when the sound healer is static. The third technique is spinning the pulsating gong about its suspension axis. An added variation to this motion is allowing the spinning gong to vertically rise and fall towards and away from the client. This method is often employed over the client’s head to synchronise the two hemispheres –the logical left side and the intuitive right side, of the brain. 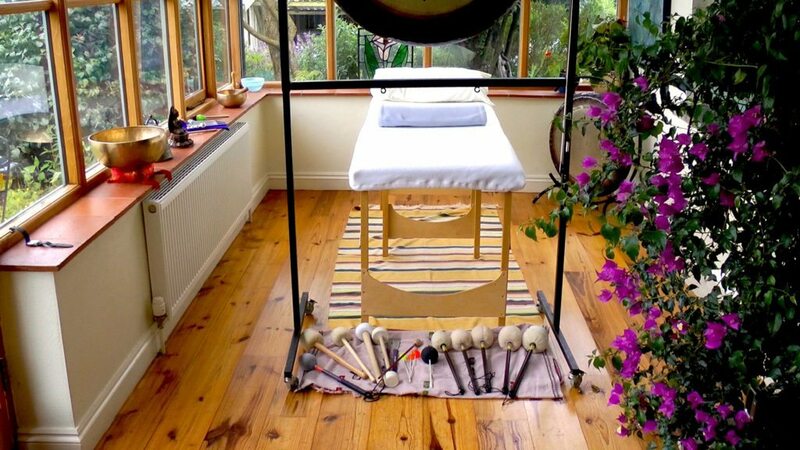 It is easier to play and manoeuvre the gong over a client when they are lying down on the floor as opposed to on a therapy couch. 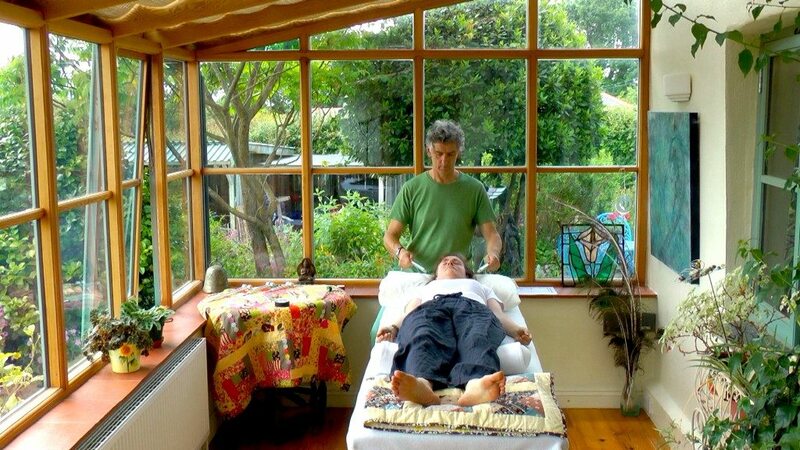 Consequently, the gong session can last longer thus improving the healing effectiveness. When working above the body it is essential to ensure that you have sufficient height and strength in order to fan, swing or spin the gong over the client.